we installed these last night. super easy. they look lovely on the windows. while they are not blaclout, they do make the yellowish streetlamps look dim, diffused, far away and cut the light entering by 80 % at least. my son said he got a great nights sleep and they were great. they look sleek and modern and really fit a nice clean aesthetic. great blind for the price and as we will be moving from this location we did not want a huge investment in the case they are left behind. we love them. Dimensions 28.0 In. X 7.0 In. X 3.0 In. I received my shades they are made of a very nice material. Very easy to hang I was very happy with the brackets much better than the old style ones. Once you hang the bracket the shade simply snapped into the brackets easy to remove for cleaning of the window if needed. They are a beautiful shade of gray as well. They let just enough light through Perfect Light filtering shades. I would highly recommend this product. I love Roman shades so this was a great purchase for my home. The color is a light gray and the shade is great at filtering the harsh afternoon sun. It appears to be very thin fabric but it does the job. So easy to install, no issues with purchase at all. They arrived in a speedy manner and was well packaged. I bought the gray ones and the color is a true gray, not bluish like some grays. You can't beat the price for the quality and I do recommend this product. I wanted simple shades, cloth and these fit my windows perfectly. I bought two different colors for different rooms. they were easy to install (though not by me) and work great. The cordless variety just pull down and back up. They are plain, which doesn't detract from my room décor. They are dark enough to provide cover but are not total black-out thick. They don't even look too bad from the outside (back side). Reasonable price for this item. I love the color and the privacy of the shade, but still getting light into the room. Easy to install. This isn't super luxurious or anything, but it's actually nicer than I thought it was going to be for the price. The color is the perfect grey and still lets a little light through which is what I wanted. I wasn't sure about the cordless feature but I actually really like it! They pull up and down very easily. Definitely recommend! Beautiful shade. Well made. Easy to use. Lets the light in but also provides privacy. This shade is perfect.lets in light, but doesn't allow anyone to see into the house. Bought them for every room in the house. I like that the top is very high, so the top part of the window is exposed when pulled up and i get more window and light into the room. The material is satin. The title says "fabric" I wanted the material to be a cotton or ruff cotton to match my décor, I would not have bought if I knew it was "satin." 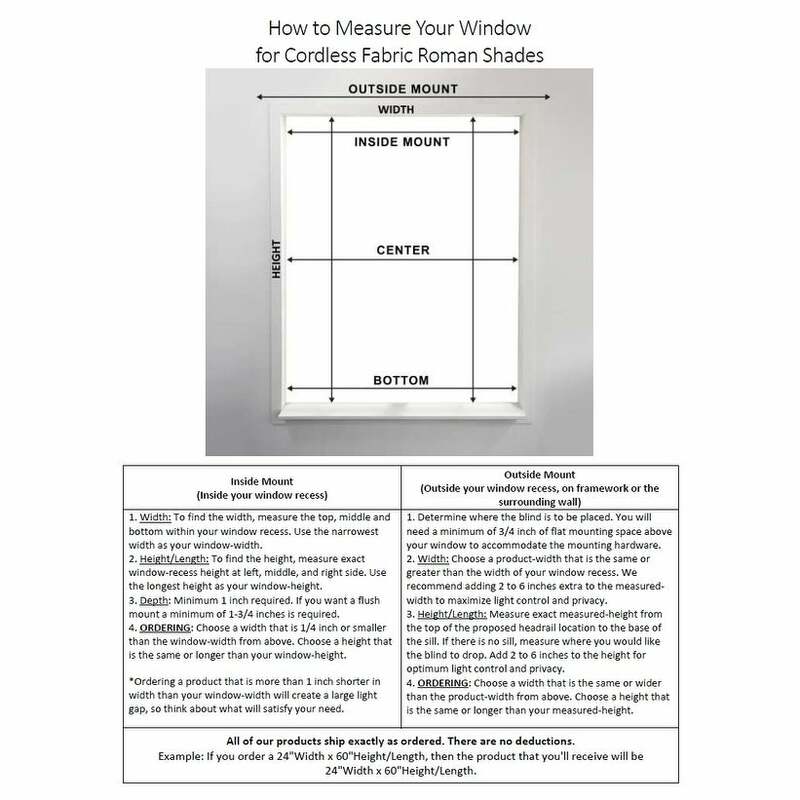 However I am keeping because it is hard to find a 22 inch width cordless roman shade and I do not want to pay for shipping back. These are acceptable quality for the price. The fabric is quite thin – which would be good if you are looking for something light filtering – but it will not block light. I would also wonder if they would even be appropriate for bedrooms or other privacy-needing spaces. Also, the fabric is VERY shiny. Which may be appealing in certain decor situations. I LOVE this shade. Simple to install and looks rich. Perfect color. Bought it for daughter's room. Looks good - simple and clean. These fit my windows perfectly! Great price and they arrived clean and without defect. Poor quality. Sent them right back and they wanted to charge me $*** to return them. Don’t waste your time or money..
Nice blinds for the price, easy to install and come in many different sizes, which I needed so all of the blinds matched. I was pleasantly surprised by how good these shades look, Very easy to install. These blinds were great for a guest bathroom. Easy to install and the fact that it’s cordless makes for a nice clean design. It is so easy to push up or bring down for privacy. "My window is not 60" long, its smaller. Will this blind still work?" "What color is the outside?" Color is same on both sides. The "cords" are white. "What depth is necessary for an inside mount? I only have about 1" depth to be able to mount inside the window frame." 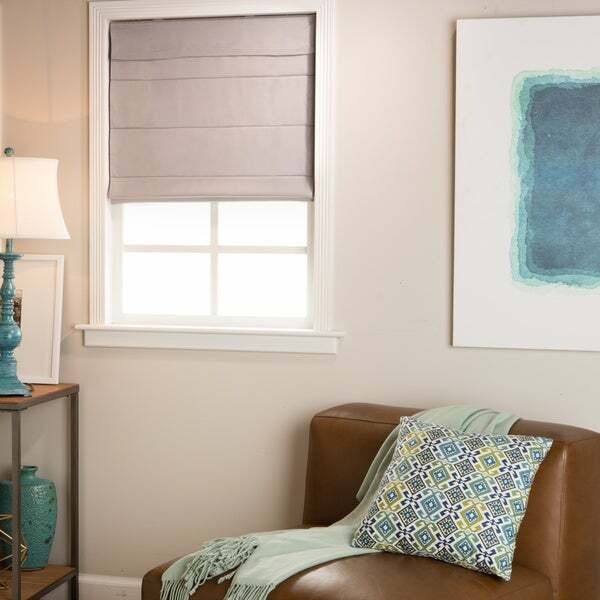 A minimum of 1.25 inches of depth is needed to mount these shades. "I need exactly 42 wide by 72 long. can I order thins. how does the 40 - 49 wide work, if I need 24 inches. do I cut off the sides to fit?" No you need to select the size in the option tab. You cannot cut off the sides. The size I needed. It’s difficult to find. To replace my old blinds my kids rooms. Looks good so far hope it’s the same in actual. "can i get this in 43x72"
We only have the sizes you see offered in the options tab. "I have these blinds, in a dark red. The exact measurement on the blind that I already have is 22 1/2". Do you know if the 22" is an exact measurement?" Yes that is an exact measurement. For the inside mount I had to go a 1/2 inch smaller when I bought these. Because the first one I received which was exact was just a tiny bit too big!